STAVANGER, Norway and SANTA MONICA, Calif., Jan. 14, 2016 /PRNewswire/ — Laerdal Medical, the leading provider of simulation solutions for healthcare, and SonoSim, Inc., a leading global provider of ultrasound education and training, today announced the commercial release of the highly anticipated Laerdal-SonoSim Ultrasound Solution for SimMan3G and SimMom. A complete spectrum of Trauma Care, Critical Care, Cardiac Resuscitation, Early-Stage Pregnancy, and Late-Stage Pregnancy Cases and Training Scenarios has been specifically created for use with the Laerdal-SonoSim Ultrasound Solution for SimMan3G and SimMom. The Laerdal-SonoSim Ultrasound Solution for SimMan3G and SimMom brings ultrasound training to life with computerized manikins that can breathe, blink, and bleed just like humans, bridging classroom learning and real-life clinical experience without putting actual patients at risk. The integration of the SonoSim® Ultrasound Training Solution into Laerdal Medical’s patient simulator platform provides an easy-to-use and highly realistic ultrasound training and proficiency assessment tool. 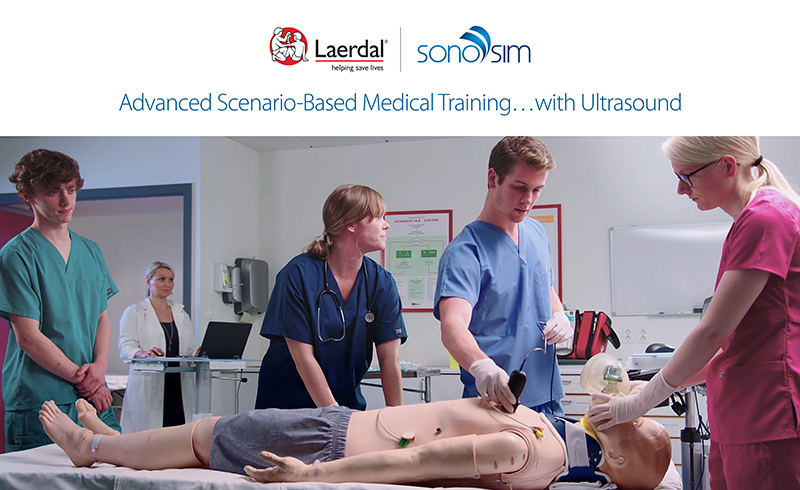 “Laerdal and SonoSim have partnered to provide a full spectrum of ultrasound training and assessment offerings. The commercial release of the Laerdal-SonoSim Ultrasound Solution is the result of more than a year of research, development, and cooperation between our companies,” said Dr. Dan Katz, VP Business Development of SonoSim. “The Laerdal-SonoSim Ultrasound Solution provides the most realistic and thorough manikin-based, ultrasound training and assessment platform available. The solution will be available to retrofit onto the installed base of thousands of simulators worldwide. We look forward to seeing the benefits of our combined efforts translate into saved lives and improved patient outcomes,” said Clive Patrickson, CEO of Laerdal Medical. Demonstrations of the Laerdal-SonoSim Ultrasound Solution are available at the 16th annual International Meeting for Simulation in Healthcare (IMSH) at the San Diego Convention Center on January 17th through 19th, 2016 at Laerdal’s booth 800 on Sunday, Jan. 17 at 3:30; Monday Jan. 18 at 12:30; Tuesday, Jan. 19 at 9:00 a.m. and4:00 p.m., and by appointment. The IMSH conference is an international symposium that draws 6,000 simulation educators, researchers, and practitioners to showcase and view the latest technologies in medical simulation. For more information about the Laerdal-SonoSim Ultrasound Solution, please contact your local Laerdal representative, or visit http://www.laerdal.com.